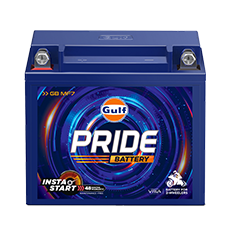 Gulf Pride Battery GB MF 7L - Gulf Oil Lubricants India Ltd.
Maintenance-free: The battery's innovative gas recombinant with valve regulated design doesn't let the electrolyte escape from the cells. So there is no need to top it up with distilled water. Advanced Lead Calcium Alloy: This alloy, present on the plates, reduces corrosion significantly. It enhances the battery's service life and gives it a superior start-up efficiency. Liquid-free AGM Separator: This makes the battery leak-proof by keeping the electrolyte in an absorbed state and not as a free liquid. ABS Case: This provides better heat and electrical insulation compared to normal or conventional battery containers (PP). COS (Cast On Strap): This ensures rigid holding of plates inside the battery. It helps withstand extreme vibrations from the vehicle during usage. Advanced Sulphate Resistance Technology: This drastically reduces the self-discharge rate, helping increase the battery's life during usage/storage. #Discount on prevailing MRP against purchase of new Gulf Pride Battery only.